Designed for small to medium businesses, multiple users can easily share the benefits of this fully featured laser fax machine. Its innovative design incorporates a high capacity, front-loading paper tray that simplifies paper handling, and a high monthly duty cycle, geared for departmental support. 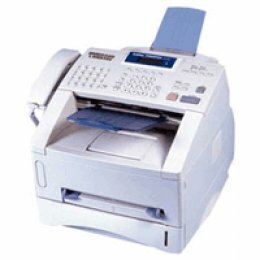 This feature-rich model is equipped with a fast modem to reduce transmission time, abundant memory for worry-free fax storage, and a built-in USB interface. High-Speed 33.6K bps Super G3 Fax Modem, transmits as fast as 3 sec.pg.